The size of a pack of playing cards the Ducati cameras are half frame (18x24mm) cameras using special cassettes, very heavy for their size and often referred to as a miniature Leica complete with twist and pop out lens. 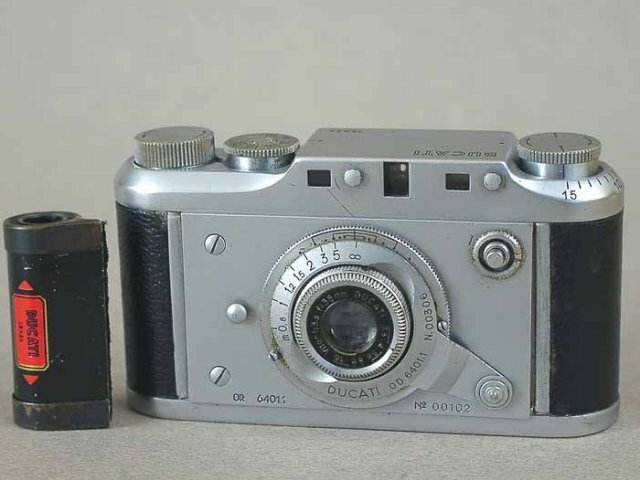 The Ducati Sogno, or Ducati Dream was the first truly well designed and flexible half frame system camera to exploit the half frame size negative in order to build a small very fine quality camera. It appeared after the Second World War in 1946 by the Societa Scientifica Radio Brevitti Ducati of Milan, a major manufacturer of electronic, mechanical and optical goods founded in 1926. Production was short lived, and creased, in 1953, when the three Ducati brothers left the firm. When held in landscape mode, camera held long ways up, the shutter is to the right of the viewfinder and the shutter released with the right hand. In portrait mode the camera's shutter is operated by the left hand. The Lucky 35, also made in Italy, is much larger, it's +/- 11.5cm wide and 7cm tall while the Ducati is approximately 10cm wide and 5.3cm tall. The Ducati is also thinner at 24mm compared to the Lucky 35 at 29mm. The Sogno was intended for production in 1939 but the war interrupted production and so it made it debut in 1946. The Sogno or Dream is a true range finder camera very much resembling a small Leica IIIc. It was conceived as a system camera and sold a large range of lens and accessories. In selecting half frame, 18x24mm format the designers also decided to use special cassettes and provide daylight re-loaders from standard 35mm film cassettes and bulk loading 35mm rolls. Although this means that the camera only takes 15 frames it is simple enough to carry a few cartridges as they take up less space than a 35mm cartridge. 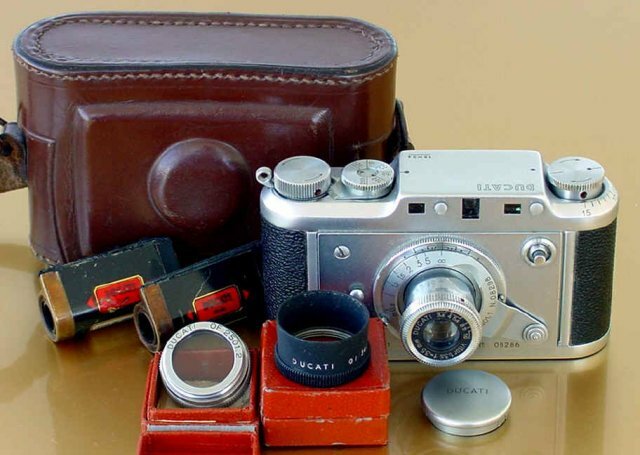 The camera is very small and solid, supplied with first rate optics making it desired by collectors and users alike. The shutter has click stops for B, 1/20, 1/50, 1/100, 1/200 and 1/500 on the top of the camera. The lens itself has settings for aperture and focusing. Early versions of the Ducati Sogno have the placement of the dioptric correction on the finder ocular instead of the usual placement under the speed selector. The Simplex was launched along side the flash synchronised Sogno in 1950. As it's name suggests this a simplified version of the Sogno with a fixed collapsing Etar 35mm f3.5 lens, It lacks a range finder and has a small viewfinder. Focal plane shutter and shutter speeds of B, 1/25, 1/50, 1/100 and 1/250. Like the Sogno the shutter is released by the left hand in portrait mode. Ducati O.R. 6401.11 is identical to the Sogno but with internal flash synchronisation made in 1950. Ducati Sogno with coupled rangefinder and the inscription "for collaborators" and "not transferable". Only a few hundred pieces where made for Ducati employees. Made in 1950. Ducati Sogno with coupled rangefinder and the inscription "Sperimentale". The inside mechanism is changed. Made in 1950. Ducati Sogno with coupled rangefinder and shutter speeds 1sec, 1/2, 1/10, 1/50, 1/100, 1/200, 1/500 sec + T. This has a taller modified back. Made 1950.